Mint Brownie Truffles – Transform your pan of brownies into these amazing mint brownie truffles! Simply crumble cooked brownies, add melted mint chocolate, roll into balls, and then coat in melted chocolate. That’s all there is to it! And the colors are perfect for St. Patrick’s Day! It’s that time of year – Girl Scout Cookies are among us again. Everywhere you turn, there are Girls Scouts (or their parents) pushing those addictive cookies. You can’t escape it! This year, however, I was strong and didn’t end up buying a ton of cookies like I normally do. In fact, I didn’t buy any at all. I’m pretty proud of myself. But I’ve still been getting a pretty strong craving for Thin Mints so I decided to do something about it. I’ve been wanting to make brownie truffles for the longest time. They’re kind of like cake pops (or cake balls) but made with brownies instead of cake. With my craving for mint chocolate hitting pretty hard, I decided to make mint brownie truffles. These mint brownie truffles have the shape of a classic chocolate truffle, the texture of brownies, and the flavor of a Thin Mint. Could you imagine a better mash-up?! Plus, the colors make it the perfect St. Patrick’s Day treat. Aren’t they the cutest?! These truffles are super simple to make, too. All you do is bake a 9×9 pan of your favorite brownies, break into little pieces, add melted mint chocolate, roll into balls, and dip into melted chocolate. That’s it! For the brownies, I was lazy and decided to bake my favorite boxed brownie mix instead of making some from scratch. But that’s the beauty of this recipe – it doesn’t need to be overly-complicated to make amazing mint brownie truffles. Make sure the brownies are completely cool before trying to make the truffles. If they are too warm, they won’t want to form into balls, which will make it almost impossible to coat in chocolate. Speaking of chocolate coating, you’re going to want to use melting chocolate for dipping. Melting chocolate dries perfectly solid without refrigerating, whereas baking chocolate (like chocolate chips) will never get fully solid after it’s been melted. Melting chocolate is a game-changer, guys. Here’s the melting chocolate that I used. When you’re drizzling the white and green chocolates over the truffles, you don’t need a fancy piping bag. I simply used a ziplock bag and sniped off the corner. Alright guys! That’s all you need to make these decadent little truffles. I hope you love them! Transform your pan of brownies into these amazing mint brownie truffles! Simply crumble cooked brownies, add melted mint chocolate, roll into balls, and then coat in melted chocolate. That's all there is to it! And the colors are perfect for St. Patrick's Day! If you haven't baked your brownies yet, do those first. Let them cool completely before making the truffles. Once the brownies are cooled, break apart using your hands. This is a fun task to do with kids! Set aside. Melt 5 ounces of creme de menthe chocolate in a large bowl in the microwave for 30 seconds. If it needs more time, microwave for another 15 seconds. Add broken brownie pieces to the melted mint chocolate. Combine with a spatula. Roll dough into 24 even truffles of about 1 1/2 tablespoons. Place them on a large baking sheet and set aside to set. In a small bowl, melt the melting chocolate in the microwave for about 30 seconds. Stir to help the melting process. If it needs more time, place in microwave for another 30 seconds. Grab one truffle and dip into the melted chocolate to coat it completely. Using a fork, scoop it out of the chocolate and let the excess chocolate drip off. Place back on baking sheet. Repeat with remaining truffles. Let them sit for 5 minutes to finishing setting. If you did not use melting chocolate, it will take longer for your chocolate to set, so place in the refrigerator to help it along. Melt almond bark in the microwave for about 30 seconds. Stir and microwave for about 20-30 seconds. Place half of the melted almond bark into a ziplock sandwich bag. The easiest way to do this is to place the ziplock bag into a small cup and have the edges wrap around the outside of the cup like a trash bag does on a trash can. Then, pour the bark into the bag and zip. For the remaining melted bark in the bowl, add 1-2 drops of green food coloring and mix. Place into a separate ziplock sandwich bag and zip. Cut a small corner off of the ziplock bag with green almond bark. Drizzle over the truffles until all is used. Cut a smaller corner off of the ziplock bag with the white almond bark. Drizzle a little bit over the truffles to give a little bit of white color for added decoration. I think it looks best when you use only a little of the white, but decorate however you see fit! Let them harden up before storing, about 15 minutes. Oh my goodness, I wish I had these right now! They look absolutely amazing! Saving to make soon! These look delicious! Just what I need to fill that chocolate craving! Great photos! You are super woman if you did not buy and GS cookies this year. I truly only bought mine for the Hubby. These look incredibly delicious! Being a huge fan of chocolate mint ANYTHING, I plan on making these delectable treats ASAP! Yum! These look amazing! Is there anything better than a mint and chocolate combo?? What an amazing treat! Mint and chocolate are so perfect together! Can’t wait to have these! and will have to try this out. Not sure if I will be able to make them look as pretty as the ones in your pictures, but I will try. It is the taste that counts, right?! Yes please! This looks like the perfect dessert, especially with St. Patrick’s day coming up and not to mention Girl Scout Cookies. I’m a big mint fan. Pinning this for later. YUM! These sound extra chocolatey and the addition of mint is perfect. This is great for Partick’s Day! Those truffles look absolutely amazing! I’m on a personal mission to try as many new recipes as I can this year, and I think this may just be one that I have to try! 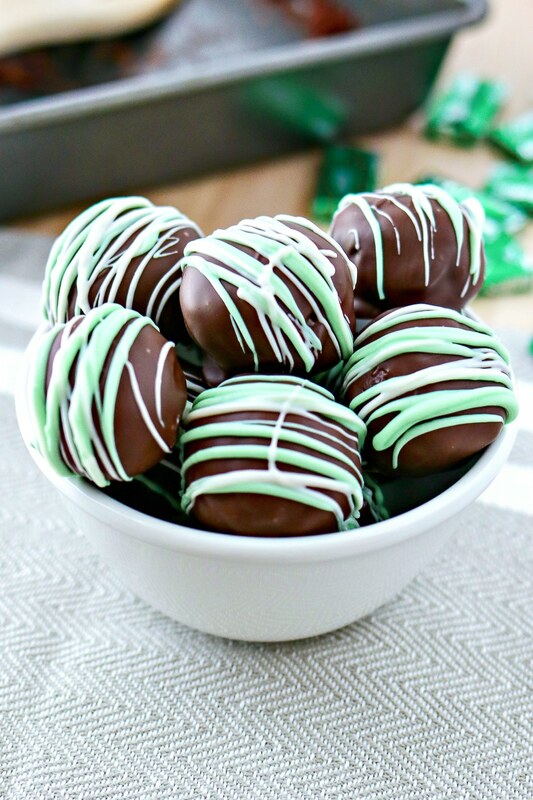 I’ve never made or even eaten truffles before, but I LOVE mint chocolate flavoured anything so I’m sure I’ll love these too! I gave into my cravings one day, but I haven’t since then. 😛 I might need to make these mint brownie truffles though, they look amazing and I bet they would get rid of my Thin Mint cravings! These look absolutely delicious! Perfect for Easter that’s coming up soon. The mint green color on the outside makes me think of Easter. Thanks for this! Oh my goodness! These look beautiful and delicious. I so need to make these with the kids! Thanks for sharing. Theses look absolutely indulgent!!! Saving it for later!! Oh my goodness! This is definitely going on my list of recipes to try! This is so creative! Looks delicious! That drizzle is so pretty and the flavor and texture sound amazing! They look so easy to make and perfect for celebrating St. Patrick’s Day. Not only do those sound DELICIOUS, they’re so pretty! Ok you found a way to break this down to something that I can handle. Thank you for saying that you used a brownie box mix. I now know that I CAN do this. Aw yay! That’s what I love to hear. Not all baking has to be challenging. I hope you like them! These look amazing. I snuck 2 Thin Mints in before going to bed, but this looks like something I’d enjoy even more! Andes mints are one of my favorite candies so this recipe looks like it’s right up my alley. Can’t wait to give it a try! Oh man! Then you are gonna love these babies!